Life in New Zealand ain’t all that bad. However, we have to admit, we do, on occasion, get jealous of those living it up in Europe. To celebrate all that is good about this glorious continent—the delightful accents, the glorious tans, and afternoon siestas—we’ve teamed up with 2016 European Car Of The Year, Holden Astra to bring you this restaurant crawl of the best European fare in Auckland. Including everything you’d expect from a chic Euro ride—heated, leather-appointed seats, a rear-view camera and incred’ touch-screen technology that literally does it all (gives directions, makes calls, sends messages, annnd plays music)—we couldn’t think of a better way to get around Auckland to sample the wares from Auckland’s finest European restaurants. From handmade Italian pasta and flavoursome French escargot, to tender Turkish lamb and moreish Spanish tapas, we tried it all (tough gig, huh?) to bring you the ultimate guide to Auckland’s best European restaurants. If you’re serious about pasta (and other Italian fare), make a beeline for Amano. The restaurant mills its own flour before hand making every type of pasta imaginable. Placing an importance of using seasonal, local produce, the menu changes daily—it all depends on what their fishermen have caught and what their farmers have harvested! Expect to feast on the likes of eggplant pappardelle, kingfish crudo and not-to-be-missed Italian breads. You haven’t tried meatballs until you’ve savoured Baduzzi’s polpette (that’s Italian for meatball). Their signature hand-crafted morsels are made with ingredients such as crayfish, wild deer and braised beef. While you could happily eat your way through their meatball menu, Baduzzi’s other dishes are also incredible. Charcoaled lamb ribs, eggplant parmigiana and crispy zucchini flowers…you’ll want it all! Sean Connolly’s Gusto at the Grand also has a reputation for amazing Italian food. Start with bruschetta or antipasto before moving on to a caprese salad, crispy pork belly or flavoursome mushroom and ricotta gnocchi. However, the dessert menu is where the real magic happens with panna cotta, tiramisu and sweet ricotta-filled cannoli all up for grabs—we’ll have one of each, thanks! You’ll feel as though you’ve been magically transported to Paris when you dine at Augustus Bistro. Located in the historic Ponsonby post office, the venue—not to mention the food—is incredible. The oh-so French menu is all about charcuterie, steak tartare, veal cordon bleu and—of course—escargot! 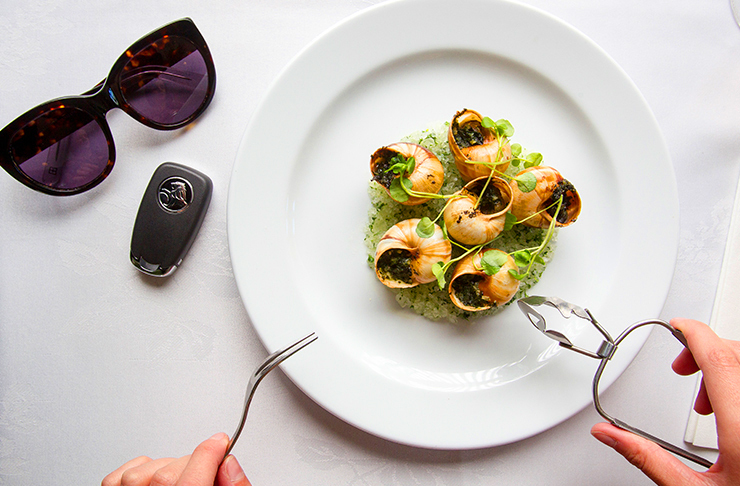 The escargot (aka snails) are nothing short of traditional, served with a flavoursome garlic and herb butter. No visit is complete without braving a serve of these delights! Chef Nick Honeyman has combined his love of French cuisine with his passion for fresh, clean eating. The result? A lighter take on classic French bistro fare. Paris Butter is all about chicken liver parfait, confit chicken leg, pan-fried snapper and his take on escargot—it’s made with clams! Stick around for dessert because the dulce de leche crème brûlée is out of this world. No round-up of European restaurants would be complete without mention of The French Café. Named one of the world’s top ten restaurants, you can guarantee this will be a meal to remember! You’ll be working your way through roasted goats cheese, crayfish carbonara as well as lamb and ricotta beignets. Wash it down with a glass of Champagne because when in Rome at The French Café. Tucked away in Ponsonby, you’ll stumble upon eclectic and quirky eatery Gypsy Caravan. The menu takes inspo from the Mediterranean and the Middle East, with Turkish influences. The signature dish here has got to be the pan-fried cheese. 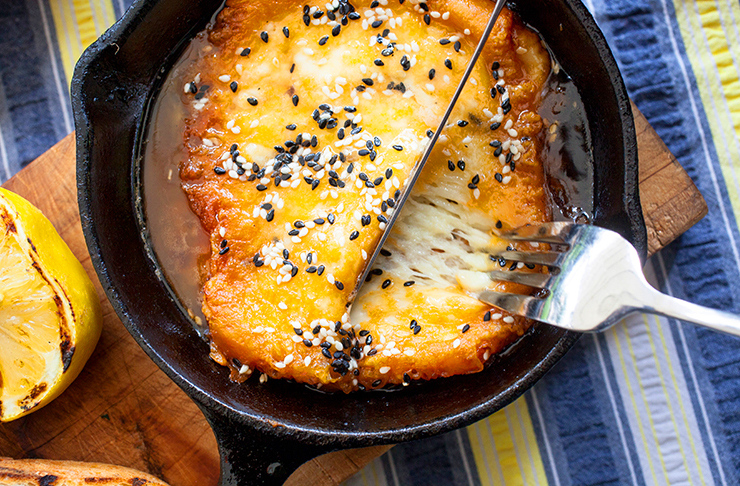 The dish is drizzled with ouzo before being set alight right before your very eyes—hello ooey, gooey cheese! The charred cabbage, avocado falafel and lamb rump are also amaze. Situated in the stunning historic Lopdell House, Deco Eatery is bringing a taste of Turkey to West Auckland. The light, bright and beautiful eatery serves the likes of rich tomato and capsicum menemen with perfectly poached eggs, lemon roasted chicken tagine and fattoush salad with slow-cooked lamb shoulder. Their Turkish treats are also perfected with handmade Turkish delight, baklava and pashmak (aka Persian candy floss). Sitting pretty on Devonport’s wharf is the aptly named Devon on the Wharf. Paying homage to the owners’ Turkish heritage, the menu is packed with flavour. The restaurant’s signature platter is a crowd favourite (it’s packed with filo pastry cigars, hummus, Turkish mussels and more), while the stuffed capsicum dolma is an Urban List fave. Bringing a taste of Spain to SkyCity is Bellota. You’ll discover one of the most extensive tapas menu in Auckland. The chicken and ham croquettes with blue cheese sauce are a good place to start before moving on to patas bravas, crumbed goats cheese and mixed olives. Wash down with a vino (or two)—they import some of Spain’s finest wine. Jump on board the ferry to Waiheke and pretend like you’re sailing the Mediterranean (one can dream, right?). Surrounded by grape vines, Casita Miro is a rustic vineyard that is delightfully Spanish. There’s more tapas than you can poke a stick at and mains of paella, braised ox cheek and roasted market fish. Make sure you’ve got time on your side because you’ll never want to leave this beautiful venue! Editor’s note: This article is proudly sponsored by Holden Astra and endorsed by The Urban List. Thank you for supporting the sponsors who make The Urban List possible. Click here for more information on our editorial policy.